Approximately 38,000 ANZ Bank customers who are part of a class action to fight the return of more than $220 million bank fees, get their day in court today. The ANZ Bank case is the test case as part of a wider bank class action involving around 170,000 customers against eight major banks, including ANZ, BankSA, BankWest, Citibank, Commonwealth Bank, National Australia Bank, St George Bank and Westpac Banking Corporation. The customers are arguing that certain fees charged were out of proportion and beyond the actual cost incurred by the banks, including fees of $25 to $35 for being $1 over on their account, or a day late in payment. The court will have to decide if the fees were fair and justifiable. The banks previously unsuccessfully attempted to have some fees, including dishonour fees, removed from the action. If successful, this case could have implications for Australian companies broader than just banking and financial institutions, for example utility companies that charge administration fees if a bill is paid late. LAWYAL Solicitors will keep you updated on how this case progresses. There are a few professions which evoke a certain ‘old-school’ feel. Innovation isn’t the done thing. Talk of technology means email and often not much else. The law is one prime example – but who says it has to be? Leonie Chapman has been a lawyer for over a decade in banking and finance law, and has worked for some of Australia’s biggest name corporates. A desire for greater flexibility led her to think outside the box. Armed with the experience of working in an activity-based work environment, (working from anywhere with just a phone and a laptop) and seeing friends and family with businesses without access to legal services – the idea for a virtual law firm came into being. “The idea started getting really big, and then we eventually refined it, and came up with what we think is the perfect solution for small to medium enterprise, and financial institutions, who don’t necessarily need to go to the large, external law firms that are extremely expensive, and sometimes difficult to deal with,” Chapman tells DB. And so LAWYAL Solicitors was born. The way it works means any Australian business can seek and gain legal advice from an experienced lawyer, entirely online, using just a laptop, tablet or mobile. Chapman says that by stripping away the unnecessary frivolities of law firms, like maintaining expensive offices with water views, and offering clients tea and cake, means her business can charge at almost half the hourly rate of mid, and top-tier firms. “I’m also a huge believer in fixed fees. I think it’s absolutely possible and necessary for law firms to start fixing their fees for clients, so they have certainty of costs – especially for smaller clients. There’s an hourly rate as well, and I’ve done a lot of research across Australia, and for me – as well as the others who will all have 10+ years post admission experience – we charge at two thirds to a half the rate of an equivalent lawyer in a medium to top law firm,” Chapman says. Now with a second consultant also working from home, Chapman says that with professional indemnity insurance, an ABN, and a laptop – her online legal service is already proving to be popular. Utilising all the modern tools of running an online business, like social media for marketing and networking, and renting the occasional boardroom office space for any large client meetings, Chapman has brought innovation to an infamously old-fashioned industry. LAWYAL Solicitors (pronounced ‘loyal’ solicitors) was founded by Leonie Chapman in mid 2013. 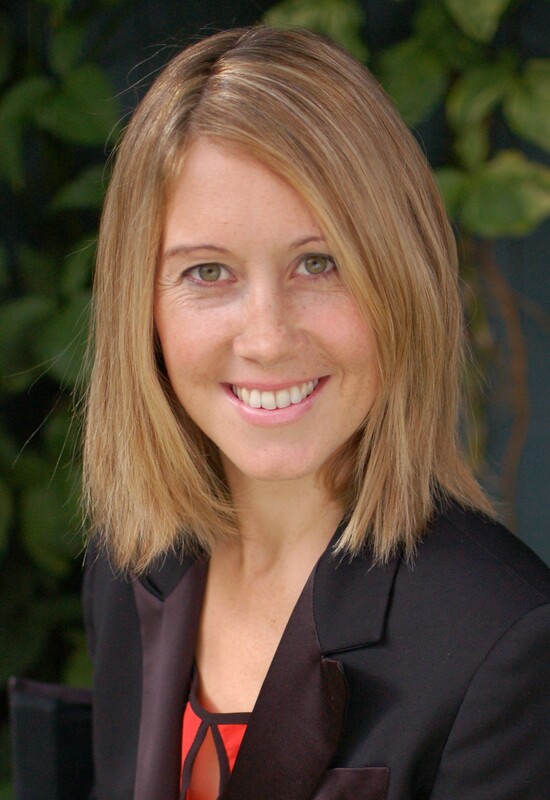 Leonie is a commercial lawyer who has worked in top law firms and in-house. She has spent the majority of her career in-house for high profile companies. In these roles, Leonie has been exposed to a certain style of practice that has been prevalent for a long time. It is one that has inflexibility and excessive cost ingrained in it which unavoidably results in negative consequences for both lawyers and clients. Starting a new law firm was Leonie’s chance to build a firm based on professionalism and specialist expertise yet avoid the negative work practices that lawyers and their clients have suffered for so long. Technology has been a key element in helping to achieve these goals. It plays a role in how LAWYAL Solicitors works with clients, how the legal work is done and how the law firm is managed. The benefit of being a new firm is that it is not weighed down by legacy technologies or trapped in out-dated work practices. It is one thing to design a law firm from the ground up in accordance with ideal specifications but how do you actually put it together? Who is going to advise you on whether your ideas can be implemented technologically and whether software can be bought off the shelf or needs to be custom built? Once you have received this advice, who is actually going to build it for you and how will you be able to justify the cost? Leonie found the answer to these questions and challenges: The answer came in the form of her chief technologist, programmer and (financial and sweat-equity) business partner – none other than her spouse Craig Chapman. Leonie says that he loves writing software and she loves writing legal advices. From Legal Practice Intelligence’s point of view, this is a practice management perfect match. Craig is a full time technologist at a major telecommunications company. One can imagine that he has not had many free weekends since they came up with the idea of LAWYAL Solicitors. Leonie has a lot of friends and family who have small businesses. Their feedback to her was that they often don’t get help from lawyers because it is too inconvenient and time consuming to visit a law firm. Leonie believes that if business clients had online access to lawyers and legal documents, they could have a cost effective and convenient in-house type of legal service. What are Leonie’s ideas about legal practice that Craig has dutifully built or is in the process of dutifully building? Flexibility: not being tied down to any particular physical work place. One of the keys to this, according to Leonie, is not to be paper-based. Client Service: Working with clients as much as possible online. Reduced Overheads: Enable services to be delivered at a lower cost and thereby be able to provide higher quality legal services to a greater number of businesses. LAWYAL Solicitors’ proprietary work platform is designed to be a beginning-to-end workflow system that is entirely online. It includes: generating proposals; new-client intake; assigning matters to lawyers; tools to do the legal work and collaborating with clients. What makes LAWYAL Solicitors’ adventure into online legal services even more special is that Leonie and Craig Chapman perceived the need for the platform themselves. Although this type of law practice is becoming more widely known and accepted, LAWYAL Solicitors is not a case of blindly following the latest fashion or overseas trends. The LAWYAL platform is being developed from well-thought-out principles which are implemented and refined in actual practice. LAWYAL Solicitors is actively encouraging independent practising lawyers to join with them for cross referrals, to work on client matters and co-operate in other ways that take advantage of this developing technology platform. Note: Craig Chapman is not to be confused with another person of the same name who is a Sydney-based technology manager for a large law firm. Lenders and financiers often provide finance to a company borrower on the basis that the company directors give personal guarantees to the financier, guaranteeing the due and punctual performance of the company. The recent judgment in Goldsmith v Macquarie Leasing Pty Ltd, handed down by Dixon J in the Supreme Court of Victoria on 28 June 2013, deals with many complex legal issues relating to the enforcement of guarantees. 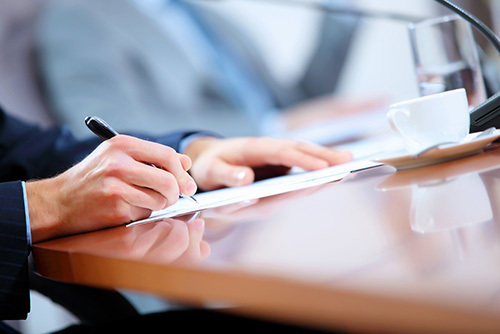 The key issues include the requirement for a guarantee to be in writing under the Instruments Act 1958 (Vic), whether the identity of a principal in a guarantee is necessary for the enforceability of that guarantee by the principal, and questions relating to principles of agency. Despite these matters, it is clear from Dixon J’s judgment that any director providing a guarantee for a company’s financial obligations should think carefully about doing so, and should consider the very real risk that the director may at some point have to make good that guarantee. Corporate Finance Pty Ltd, as trustee for the Corporate Finance Unit Trust (Corporate) and as agent for the financier Macquarie Leasing Pty Ltd (Macquarie), entered into a Commercial Hire Purchase Agreement on 5 March 2008 (Agreement) with YoMo (Australia) Pty Ltd (YoMo). The directors of YoMo guaranteed the performance of YoMo’s contractual obligations under the Agreement by executing a guarantee and indemnity (Guarantee). YoMo defaulted and, after terminating the Agreement, both Macquarie and Corporate sought to enforce the Guarantee by serving a notice of demand on each director guarantor for the outstanding balance due. In the Magistrates Court, each director guarantor except one, Mr Goldsmith, admitted to entering into the Guarantee with Corporate. However, they contended that as Macquarie was not a party to, or disclosed as principal in, the Agreement, Macquarie could not enforce the Guarantee against the directors. They argued that Macquarie’s identity was a necessary requirement for enforceability of the Guarantee, by reason of s 126 of the Instruments Act, and denied that Corporate had the authority to act as agent for Macquarie. Mr Goldsmith separately argued that there was no evidence that he had executed the Guarantee at all, and should not be personally liable. The magistrate found in favour of Macquarie and Corporate, holding the Guarantee enforceable and binding on all directors. The directors appealed to the Supreme Court, seeking orders that the magistrate’s findings be dismissed for five key reasons. First, the directors argued that the magistrate incorrectly held that s 126 of the Instruments Act had been complied with. Second, they claimed that Corporate did not have authority to act as Macquarie’s agent, and Macquarie was not principal of Corporate and was therefore not entitled to enforce the Guarantee. Third, the directors believed that the magistrate erred in finding that it had been properly established that Mr Goldsmith executed the Guarantee. Finally, the directors attempted to argue the fourth and fifth reasons, which were less significant, being that the magistrate erred in relying on the affidavit of Steven Alexander, and that the amounts claimed by the defendants were calculated incorrectly in accordance with the terms of the Agreement. Each key issue argued on appeal has been summarised below, along with Dixon J’s very well-articulated reasons, the evidence relied upon, and the final decisions. Issue 1: Was the requirement of writing complied with? Had the requirements of s 126 of the Instruments Act been met? The directors questioned here whether Macquarie was entitled to rely on the Guarantee when it was not a party to, and was not sufficiently identified or named in, the Guarantee as an interested party or principal. After lengthy analysis, Dixon J found these grounds to be without substance and believed that this contention, even if accurate, was not fatal to Macquarie’s case and not really to the point. The directors argued that the proper application of s 126 required that “the agreement on which the action is brought, or a memorandum or note of the agreement, is in writing”. Relying on this provision, they argued that Macquarie’s identity was a necessary requirement for enforceability of the Guarantee. The directors also relied on Rosser v Austral Wine & Spirit Co Pty Ltd in their argument that “the parties to the agreement must be named in writing or at least sufficiently identified therein”. As it turned out, this was essential to the directors’ appeal, as it was Macquarie, not Corporate, that suffered a loss. Dixon J found that the parties who owed obligations (YoMo), as well as the party to whom the obligations were owed (Owner), were clearly identified in the Agreement. The Owner was described in the Agreement as Corporate and its assigns, its successors and, where the identified Owner is an agent, its principal. Dixon J held that the benefit of the Agreement and Guarantee could clearly be assigned or transferred to any person by the Owner without impairing the Guarantee, and therefore agreed with the magistrate that the directors’ claim that s 126 was not complied with was misconceived. Was Macquarie a stranger to the Guarantee obligation with no interest in or standing to enforce it? Although Macquarie may not have been “disclosed” as principal in the Agreement and Guarantee, Dixon J agreed with the magistrate that it could still enforce the Guarantee in which Corporate was acting in the capacity of agent for Macquarie. In Dixon J’s views, a careful reading of the whole of the Agreement demonstrated that the Guarantee was intended to be for the benefit of the Owner, which also referred to Macquarie. Even if Macquarie was an undisclosed rather than a disclosed principal, Mooney v Williams establishes that a principal can step in and take over the benefit of an agreement made by an agent who had not previously disclosed the existence of a principal. Importantly for financiers relying on guarantees, Dixon J also noted that, while it was not necessary to determine this question in this case, according to Phillips and O’Donovan in The Modern Contract of Guarantee, the rule that an undisclosed principal could sue may extend to persons who are not parties to, and unascertained at the date of, an agreement. Dixon J therefore rejected the directors’ defence and held that it was clear, based on the ample evidence before the magistrate (outlined in the next section), that Macquarie was the true Owner. Issue 2: Was Macquarie a disclosed principal of Corporate? The directors expanded on their argument that Macquarie was not a disclosed principal by denying an agency–principal relationship between Corporate and Macquarie, contending that Corporate was not authorised to enter into the Guarantee as agent for Macquarie. However, based on evidence presented to and accepted by the magistrate, it was clear to Dixon J that Macquarie was properly disclosed as principal of Corporate. This evidence included a written Agency Agreement between Macquarie and Corporate, governing the agency relationship between them — including in relation to the Agreement and Guarantee. The directors, including Mr Goldsmith, also executed a Direct Debit Authority in favour of Macquarie that resulted in YoMo repaying the facility directly to Macquarie. By affidavit evidence (Alexander Affidavit) and in verbal statements, it was uncovered that Stephen Alexander of Corporate informed the directors that the facility was owned by Macquarie and that he in fact had no authority in relation to approvals, as he was acting under the agency agreement with Macquarie. According to Dixon J, their further argument that cl 9.1 of the Agreement expressly excluded Corporate from binding Macquarie in relation to “securities”, and therefore the Guarantee, had absolutely no merit. Dixon J explained that the terms of the Agreement also incorporated the director’s Guarantees and were not restricted to the Agreement itself. It was evident to Dixon J, and should have been to the directors also, that Macquarie was a principal taking the benefit of the Guarantee obtained by Corporate, Macquarie’s agent, with actual authority. In any case, whether or not Macquarie was a disclosed or undisclosed principal is irrelevant, as an undisclosed principal is also competent to sue on a contract made by an agent on its behalf, acting within the scope of its actual authority. The directors therefore failed to satisfy Dixon J on this issue. Issue 3: Did Mr Goldsmith execute the Guarantee? The directors submitted that Macquarie and Corporate failed, without explanation, to call the attesting witness to Mr Goldsmith’s signature on the Guarantee. Mr Goldsmith did not deny that the signature on the Guarantee was his, or that he did not give the Guarantee, but rather submitted that the Guarantee was not “properly and duly executed” — against which Dixon J wrote, “whatever that means”. As Mr Goldsmith did not give evidence denying that the document bore his signature and did not raise any issue of fact out of the circumstances of his execution, Macquarie and Corporate calling the witness to his signature was not warranted. There was enough evidence for the magistrate to be “positively satisfied” that Mr Goldsmith executed the Guarantee and, in Dixon J’s view, there was no error of law identified on this ground. Issue 4: Reliance on the affidavit of Steven Alexander? Least compelling of the directors’ arguments was that the magistrate erred by relying upon the Alexander Affidavit. This was especially so given that the directors themselves relied upon the Alexander Affidavit in explaining how their defence was developed, at which point the directors took no objection to the Alexander Affidavit being used. Dixon J held that it was not appropriate to later seek to exclude the affidavit on appeal. Issue 5: Incorrect calculation of indemnity? The directors finally contended the calculation of the final sum on two grounds. The first, which was dismissed by Dixon J, was that the sum quantified was not a “Termination Amount” specified by cl 15.1 of the Terms and Conditions. The second was the only ground that the directors managed to successfully argue, being that either the principal or the agent, but not both, could enforce the Guarantee. The Guarantee was for a single loss, suffered by either Macquarie or alternatively by Corporate as agent for Macquarie. However, Corporate’s right to enforce the Guarantee as agent was destroyed by the intervention of the principal, Macquarie, in the exercise of Macquarie’s own right. On this ground alone, the directors were successful and the finding for Corporate could not stand. Dixon J found in favour of Macquarie that the director guarantors had to honour the Guarantee, and ordered the directors to pay Macquarie the sum of $79,225.24, together with interest. This judgment will be looked upon favourably by financiers accepting guarantees from company borrowers, and perhaps even with some relief. For director guarantors, however, the decision should be a reminder to take guarantees seriously and, where appropriate, to seek independent legal and financial advice over the guarantee document. The consistent theme throughout Dixon J’s judgment was his unsympathetic attitude to the director guarantors’ case — particularly when they tried to escape their obligations through arguments lacking substance, including a rather technical and weak defence regarding the manner in which the signature on the Guarantee was witnessed. Goldsmith v Macquarie Leasing Pty Ltd  VSC 332; BC201310609. Instruments Act 1958 (Vic), s 126. Rosser v Austral Wine & Spirit Co Pty Ltd  VicRp 33;  VR 313. Rosser v Austral Wine & Spirit Co Pty Ltd  VicRp 33;  VR 313 at 314. Mooney v Williams (1905) 3 CLR 1 at 8;  HCA 34; BC0500036. J Phillips and J O’Donovan, The Modern Contract of Guarantee, Lawbook Co Australia, 2004. Referring to Briginshaw v Briginshaw (1938) 60 CLR 336;  HCA 34; BC3800027. I believe that providing unbundled legal services in Australia may be one way to provide better access to these services for small businesses. According to Harvard Journal of Law & Technology Occasional Paper Series dated February 2013 – Using Technology to Unbundle in the Legal Services Community by Stephanie Kimbro (“the Harvard Journal“), there is a recent movement of online law firms providing unbundled legal services in the US that could help solve the access to justice problem in that country. Unbundling, also known as ‘limited-scope services’, ‘a la carte legal services’, ‘discrete task representation’, or ‘disaggregated legal services’ means the provision of legal services broken down by task. The client is provided representation or advice in relation to a clearly defined portion of their legal needs, with the client undertaking the rest. This reduces cost and allows a client to pay for services only as needed throughout each stage of an advice life-cycle. Examples of unbundling include document drafting and legal form preparation using technology to handle aspects of the drafting, ghostwriting, and legal coaching and strategy. 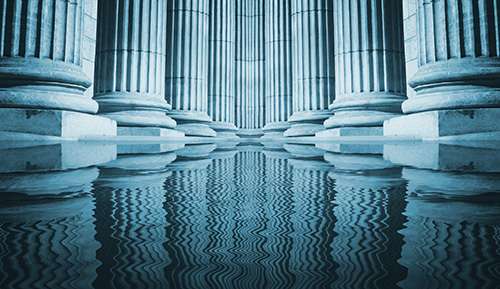 With the emergence of new forms of technology facilitating online legal services, the Harvard Journal suggests that the legal profession in the US is on the brink of a fundamental change in the way that both professionals and the public evaluate how legal assistance is provided. This is currently a very hot topic for the US legal profession. Australia will need to keep up, as using cloud-based technology appears the natural next step for expansion in the legal profession in Australia. Unfortunately, similarly to the US (according to the Harvard Journal), in Australia searching online is not the primary method of selecting legal representation. Therefore unbundled options delivered online through the use of technology may be off the radar for many seeking legal services. 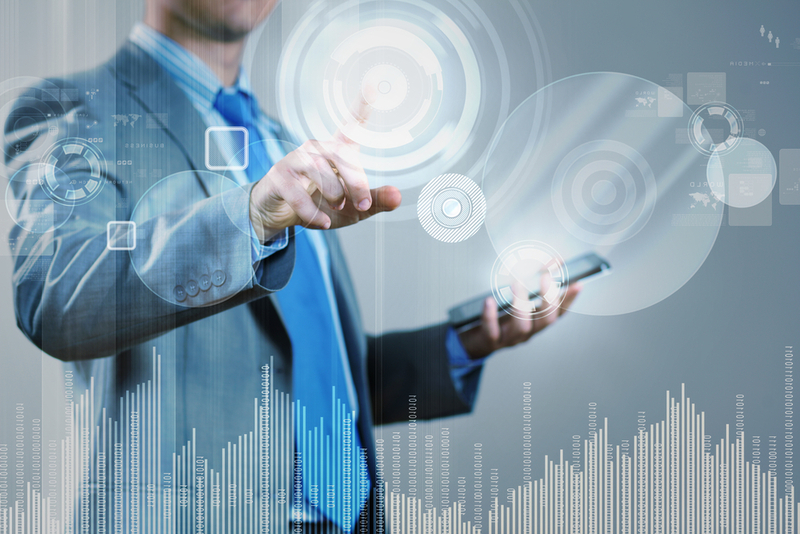 It is therefore essential that law firms in Australia start to move forward quickly to accept unbundling as a standard legal service and to find ways to integrate technology into how they deliver services to their clients. 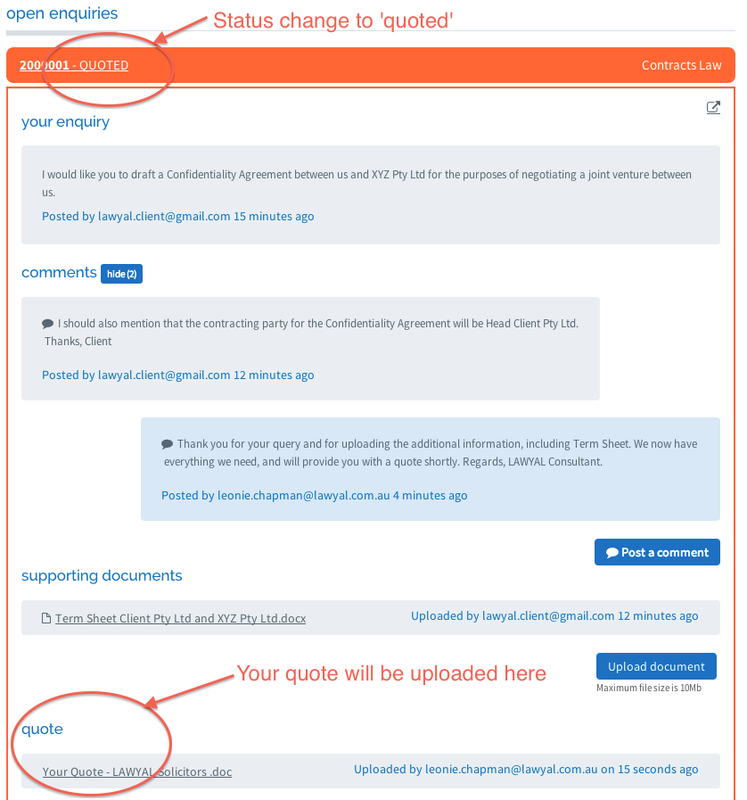 LAWYAL Solicitors has already taken this leap by providing end-to-end online legal services using bespoke cloud-based software and offering fixed quotes and unbundled legal services to Australian businesses. New developments in technology and cloud-computing allow us to more efficiently provide unbundled services where the cost of developing and maintaining the LAWYAL software can be spread out over a larger number of users. This allows for a reduced end-cost to clients. 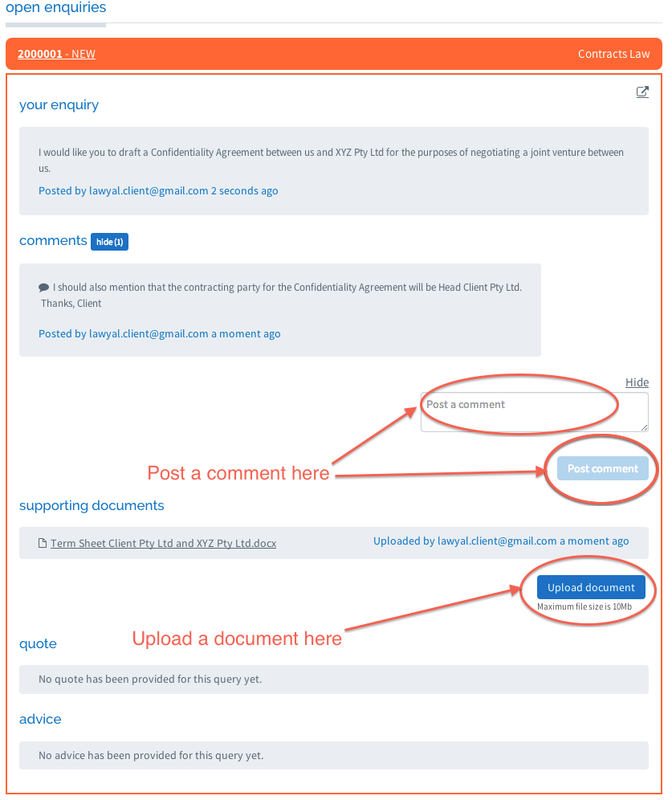 New innovations in the delivery of unbundled legal services are on the horizon in Australia, so I believe the legal services community should embrace this, as LAWYAL has. Please visit LAWYAL’s website for more information or to ask us a query anytime. While traditional law firms in Australia are lagging behind other industries on the technology front, to kick off a new technological age of mobile legal advice LAWYAL Solicitors has developed bespoke software to allow Australian businesses to seek advice from anywhere using a laptop, iPad or other handheld mobile device, monitor their query and then store and view their query entirely online. Your query will be reviewed by a highly qualified independent LAWYAL Consultant with extensive experience in the legal category you selected. When you see the status of your query move from “new” to “open”, you know that a LAWYAL Consultant is reviewing your query. 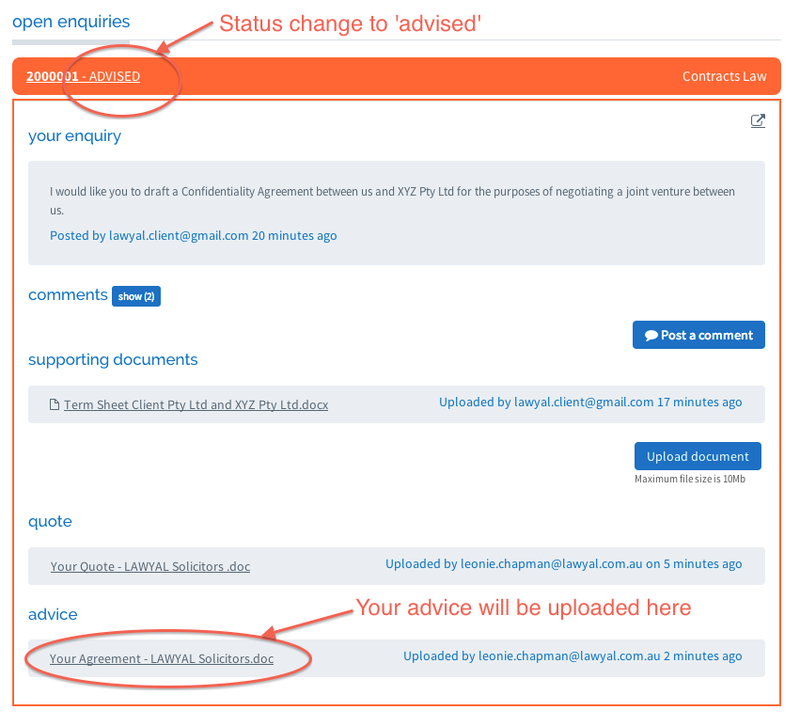 You will need to accept your quote by logging in and posting a comment, or emailing your LAWYAL Consultant directly to confirm. 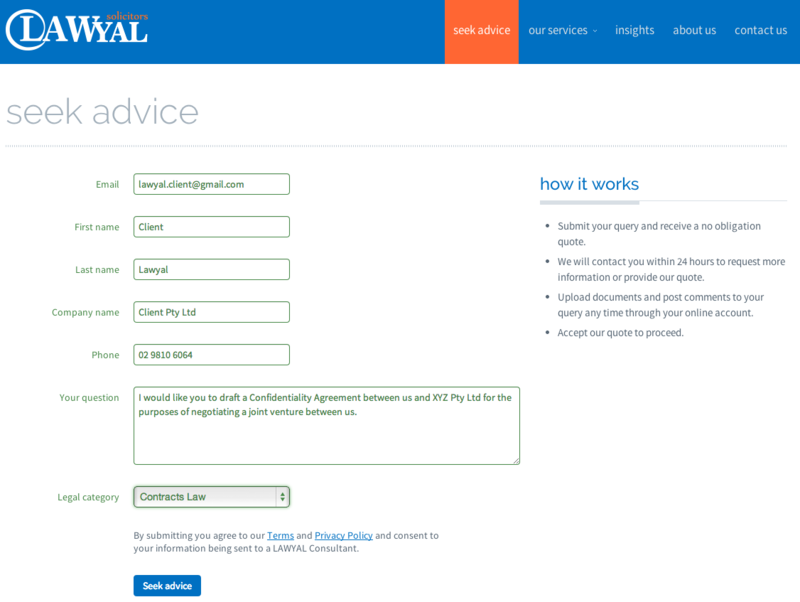 Your invoice will be emailed to you by LAWYAL for the amount quoted. Once you have paid, your matter will be closed – but you will still be able to view your closed matter online at any time. If your contracts contain fees imposed for breach or that apply upon termination, be mindful that special treatment is now given to “penalty” clauses, which may be deemed void or unenforceable. Generally, parties are free to negotiate contracts and determine what terms best apply to them. However, in the recent decision of Andrews v Australia and New Zealand Banking Group Ltd 2012 (“Andrews”) the High Court has expanded the penalty doctrine. Before the Andrew’s decision, a penalty clause in a contract arose where it stipulated an amount payable that: (a) had the nature of “punishment”, and (b) exceeded a genuine pre-estimate of loss or damage. These clauses would be void and unenforceable (“Penalty Doctrine”). In the Andrews decision, the High Court ruled unanimously that the Penalty Doctrine is not confined to where there are payments due to a breach of contract. It could also apply to termination where there is no breach of contract, or for amounts payable in certain circumstances including late payment fees or fees that are charged for an additional service provided to a party. In the Andrews case, ANZ entered into contracts with customers containing clauses that imposed cheque dishonour fees, overdrawn account fees and fees charged where credit card payments were in excess of approved limits. The High Court found that in these circumstances there was no breach of contract by the customers because ANZ had a discretion whether to allow the accounts to be overdrawn, and customers had 25 days to pay the late payment fees before there was a breach. ANZ argued that the fee was not a penalty, but instead was an additional charge in connection with the operation of the account for their increased risk when payments were not made within the stipulated timeframe. However, the High Court did not accept that the late payment fee was an additional charge in connection with the operation of the account and held that the additional fees were penalties. Organisations should review and evaluate contracts containing clauses that impose fees on their customers, with consideration given as to whether or not the fee is either to secure payment of a primary obligation by the party, or truly a fee for further services. If a fee is to secure performance of an obligation under the contract, it will only be enforceable if it is a genuine pre-estimate of the damages suffered by the party’s non-performance. If the fee is truly for further services, it will not constitute a penalty. If you’re concerned that any contract you issue or enter into contains a “penalty” clause, please feel free to speak with LAWYAL Solicitors for advice. My name is Leonie Chapman, co-founder and the Legal Practitioner Director of LAWYAL Solicitors, an online law firm created to make legal services more accessible and affordable to companies and small-to-medium enterprises (SMEs). After spending the last decade as in-house counsel for Australian banking and financial institutions and speaking with small business owners over the years, I discovered a great inequity between the access large institutions have to legal advice compared with SMEs. SMEs simply don’t have the same financial resourcing and capacity to hire permanent in-house counsel at high fixed costs, or to engage external law firms with large overheads and billable hours. As a result, by necessity SME owners develop the skills to feel their way through legal issues, relying on instinct and good business sense to assess risk and make decisions, rather than talking to lawyers. While I believe these instincts would often be spot on, this approach leaves the business open to the risk of contract breach, dispute and litigation, regulatory intervention and potentially added financial and reputation cost to their business. LAWYAL Solicitors offers a solution… convenient online access to fast, easy to understand, affordable and expert legal advice, with the familiarity of a loyal in-house counsel. With the use of technology, LAWYAL is able to reduce unnecessary process, inconvenient office meetings and costly overheads in order to keep prices down. I want SMEs to have access to legal advice for any daily issues that arise, however large or small. This may include contract drafting and advice, review of website content and terms, review of marketing collateral and disclaimers, new business start-up structuring and advice, and the protection of their brands, licenses and intellectual property rights. As we understand the internal operations of a business and its commercial drivers, we can also work closely with SMEs to help scope and implement changes in law, as well as review and audit policies, procedures, practices and documentation after implementation. By using smart technology and offering flexible fee arrangements, SMEs will pay for quality output, not overheads! SMEs can have the option of fixing or capping the legal fees upfront, time-billing matters with competitive hourly rates, or entering into monthly retainer arrangements. In particular, I think retainer arrangements can be very beneficial to SMEs for access to LAWYAL Consultants for a fixed monthly fee and capped number of hours per month. This provides a more accessible service similar to an in-house counsel. With predictable and transparent fees, we can concentrate on better collaboration with each business in order to find more creative legal solutions. For more information on how LAWYAL can help, please visit our website.